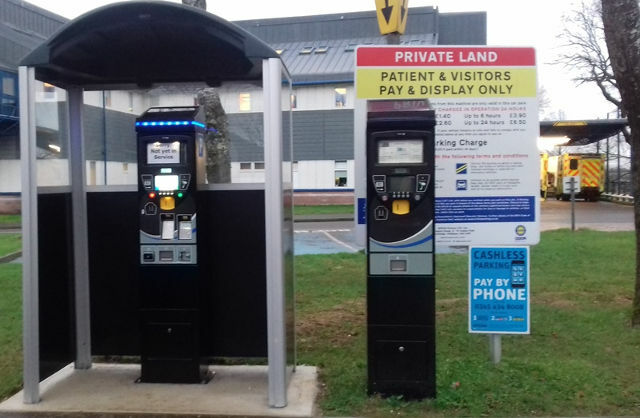 Free parking during times when lengthy queues build up is just one of the steps being taken by Isle of Wight NHS to help alleviate the pressure of parking on the hospital grounds. St Mary’s Hospital will offer free parking to visitors when lengthy queues build up at the machines to pay. A new system was installed at the hospital a year ago. An automatic number plate recognition system replaced the old ‘pay and display machines’. However, queues continue to form as visitors now pay before leaving, rather than upon arrival. At a meeting of the trust board yesterday (Thursday), hospital bosses said steps were being taken to reduce queues and delays to people leaving the hospital grounds, after visitors had complained of ‘sight problems’ when using the new machines. Steps include the installation of a telephone next to the machine, positioning officers next to the machines during peak times, and offering free parking during times when lengthy queues build up. 8 Comments on "Free parking at St Mary’s during times when queues build up"
suggest all the management are told they have to use the system for a month then they will find out more from the public if they dare to show their badges! Management get Staff allocated places so it doesn’t r4ally apply. That’s the Red Zones of which there are many. Why not put another machine in the hospital lobby as there was earlier?